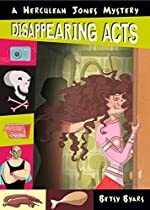 Review: Herculeah Jones is back in another hair frizzing adventure with her friend Meat attempting to solve a mystery in the book Disappearing Acts by Betsy Byars. It starts on April 1st with a practical joke Herculeah pulls on Meat. Herculeah tells Meat that she found a dead body on Oak Street but it turns out to be just a squirrel body. The small April Fools joke will not prepare them for what is about to happen. Meat has signed up for a comedy class at Funny Bonz the comedy club. On the first day of classes Meat goes to the bathroom and discovers a dead body in one of the stalls. When the body disappears, Meat and Herculeah go off and try to find clues on how to solve the mystery. This story includes a part when Herculeah finds an old camera that she had someone tell her to purchase at a resale shop. She later discovers that there is still some film inside undeveloped. Shockingly the pictures are of Meat and his estranged father who he hasn’t seen in years! Everyone should read the book because it was very entertaining because it was suspenseful and had a unique plot that no other book has. Also the book described many times so you kind of felt like you were in the story. Also another advantage was that the book only had 120 pages so it was a fast book to read from cover to cover so many age groups can enjoy this book. But the story might not be good for small age groups because it shows some minor violence and might freak youngsters out. Also barely anyone wants to read the same book for weeks and weeks. Betsy Byars the author of Disappearing Acts has gotten many awards. Betsy Byars has won the National Book award and a John Newbery Medal. She has also had some of her books appear in the best books list for the School Library Journal, American Library Association and the American Bookseller. Review written by Valerie, Grade 6. Date of review: October 2008.